Karen McCarty, aka Dr. Gingersnap, was making the rounds at Memorial Sloan Kettering Cancer Center in Manhattan. A seven-year-old sat quietly in his hospital room. His mom, who was waiting in the hall, grabbed her and asked if she could spend time with him. “The mom didn’t want her son to see her crying,” she said. The child was scheduled to have his leg amputated. Then she asked him what he wanted to do right then. The boy wanted to jump on the bed. McCarty gave him the go ahead. Next thing she knew, she was jumping on the other bed in the room. They started a friendly pillow fight. The boy’s mom heard her child laugh for the first time in a long while. The nurses and staff on the floor heard the commotion, walked into the room, and laughed, too. When the gurney appeared he hopped on without a fuss. Hospital clowning can help kids face the unfaceable. McCarty, Deborah Kaufmann, and Dina Paul-Parks have many more heartwarming stories to share. 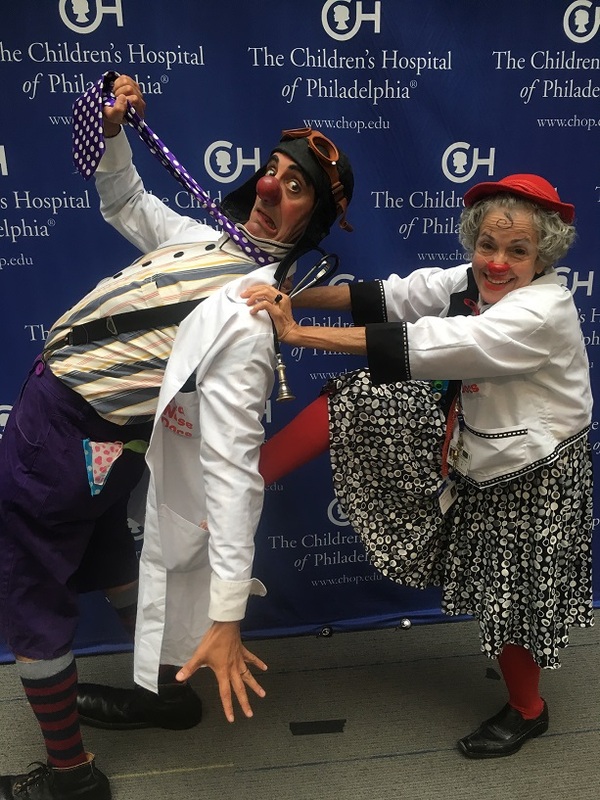 The trio worked as clown doctors with the Big Apple Circus Clown Care Unit, a community outreach program, co-founded by Michael Christensen, who established the program in 1986 in New York after losing a brother to cancer. Professional clowns and theatrical performers worked in several New York and New Jersey hospitals bringing cheer to everyone they encountered. The Clown Care Unit was going strong until a couple of years ago; last year the Big Apple Circus declared bankruptcy and Kaufmann, McCarty, and Paul-Parks came up with a plan to continue the work. “Together, we have more than 60 years of experience,” said Kaufmann, director of Training and Education at Healthy Humor, Inc., a nonprofit that she co-founded with McCarty, artistic director, and Paul-Parks, vice president of Community Programs. While they haven’t retired their red noses, they spend their days running Healthy Humor, Inc., which has a roster of 50 performers who entertain children, their parents, and medical staff. According to Kaufmann, Healthy Humor has partnered with premier pediatric hospitals around the country, including Yale New Haven Children’s Hospital, Memorial Sloan-Kettering Cancer Center in New York, Saint Barnabas Medical Center in New Jersey, and Children’s National Medical Center in Washington. The newest hospital, which makes 12, is Children’s Hospital of Philadelphia. Being naughty and silly worked for one chronically ill little girl. She was told that if she didn’t walk, her doctors wouldn’t release her from the hospital. She remained in her room and wouldn’t budge. The clowns were on their rounds. When they didn’t show up around the same time that they usually did, the girl got angry. Her mom was frustrated and exhausted. 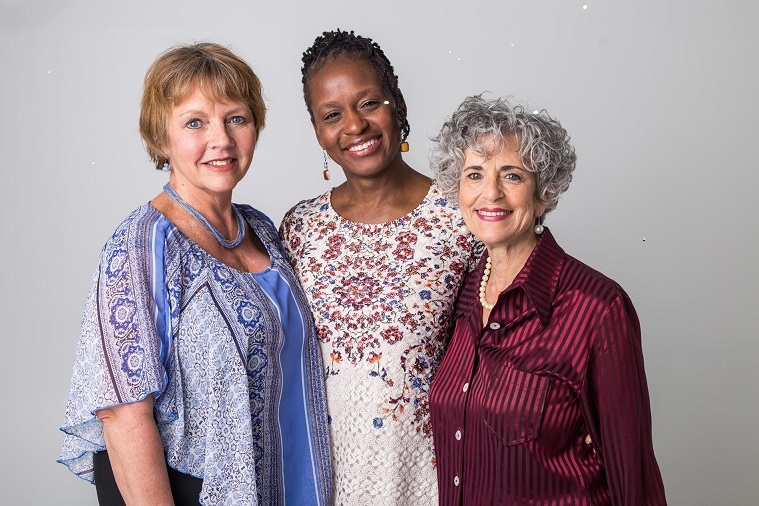 Karen McCarty, Dina Paul-Parks, and Deborah Kaufmann, co-founders of Healthy Heart, Inc.
As the clowns were about to enter the girl’s room, the mom grabbed one of them by the arm and told them she had no idea how cooperative her daughter would be. She wished them good luck. The clowns told her that she had to follow them down the hall to the place where they climbed on each other’s shoulders. The girl grabbed her pole, which helped her walk, and followed them down the hallway. She went home the next day. What the clowns provide actually helps the curative process. Good, at Yale New Haven Children’s Hospital, is impressed by how skilled the clowns are at being able to read a moment, a facial expression, and body language. She and Bogue believe laughter provides another dimension of healing.